Turns out, the more you, as the outsourcing company, invest in managing 3PL relationships – as a partner, not an overseer – the more value is delivered. In our latest Viewpoint, we cover 12 best practices designed to elicit greatness from your 3PL. 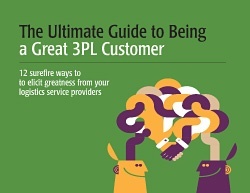 Download the Ultimate Guide to Being a Great 3PL Customer. Here are a few of the best practices included in our eBook on managing 3PL relationships. essential to a careful analysis and proposal response. Clearly define contract terms. Without clearly defined and realistic contracts, the door opens for billing disputes and debates over services, which are absolute relationship killers. Define the contract length to support investments in people and technology. 3PLs need the guts to take on prudent financial risk. But this risk must be matched by a shipper’s willingness to have these costs amortized over a longer period. Collaborate on improvement initiatives. Create opportunities to work side-by-side with your 3PL partner on lean logistics projects. Share best practices across all 3PLs. This involves bringing your logistics service providers together to share ideas, processes and innovations for the benefit of their mutual customer. Once rare, this is becoming a common practice among supply chain leaders. To read details on managing 3PL relationships and to get the full 12-point Ultimate Guide to Being a Great 3PL Customer, download it here.